Memorial Day is a Time to Remember, a time to reflect on those who have served in military service and lost their lives. It is also a time to remember those who have lost their loved ones. In my youth, Memorial Day festivities would always involve a visit to the cemetary to place or plant flowers at the graves of our loved ones. I am sorry but I give up on commenting tonight; I am not successful. Hope Blogger gets this fixed. Thanks to all of you for the Birthday Wishes. I am trlly blessed! I received a couple of early birthday presents yesterday. I went to bed last night smiling because we just found out that my son got a decent grade -- better than I hoped for-- in his Algebra II class; he had been struggling this past quarter and I was worried. Tomorrow is their last day of school and I am sooooo happy. Then, the Betty Crocker Facebook page linked to my Patriotic Groove Cookies yesterday. I received around 7,000 pageviews as a result of their link. Just goes to show you that "Betty" is still a very popular gal! 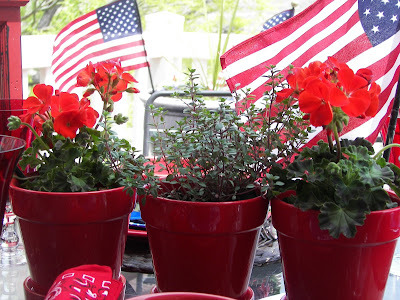 Today I set a Memorial Day table in my favorite colors of red, white, and blue; in fact I think red, white, and blue can be used all summer long; I plan to :). Lots of RED going on here which gives the table lots of energy. Week Number Four using the Red Pots :), but who is counting? I love bandanas as napkins, how about you? They are inexpensive and soft to the touch. 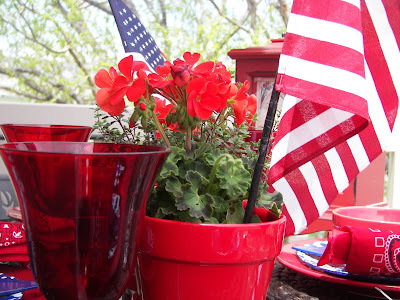 Thanks for dropping by my Red Couch to view my Memorial Day Tablescape. Happy Birthday to you sweet lady! I hope your day is as special as you are! Love the table! Love the red, white and blue. As for the pots, when you got a winner why change? They look lovely. I was planning on using bandanas for my Father's Day table. I think they make great napkins! Glad I didn't miss this post or I would have missed wishing you a Happy Birthday! I love red, white and blue, we even decorate one of our trees our Christmas with small American flags! Happy Birthday from one May baby to another. I love your happy table! Happy Birthday! 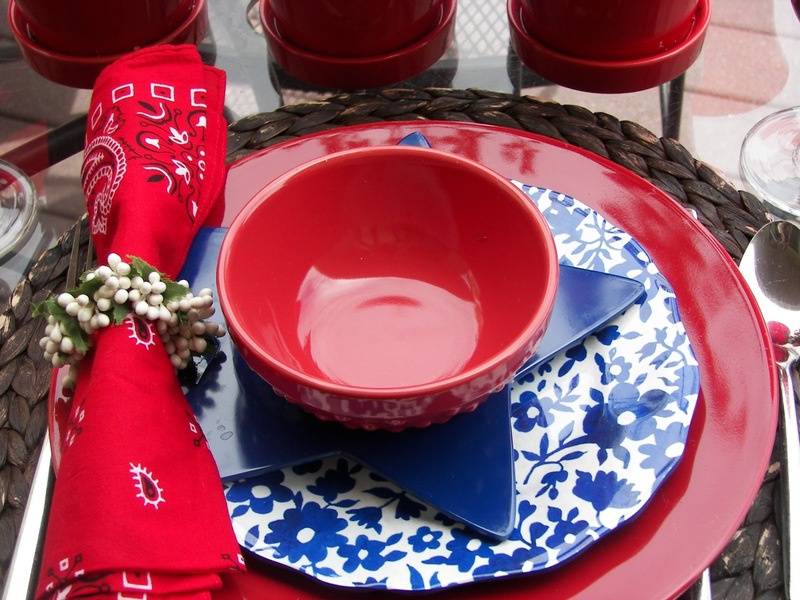 Your red,white and blue table is perfect. Super fun table.. I love the flower plates. And the red bandanas napkins.. I think I'm late with memorial day, lately just been breathing one day at a time. 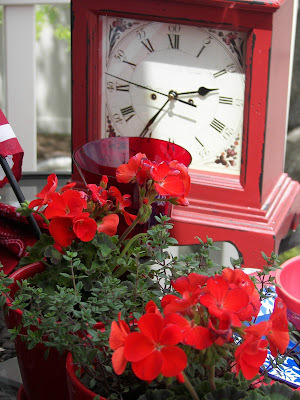 Who's counting - still love the red pots! Glad you day is filled with blessings. Hello, I am over from your sister's blog to say: HAPPY BIRTHDAY!!!!!!!! You can make it 5 weeks next week, and it would be fine by me. 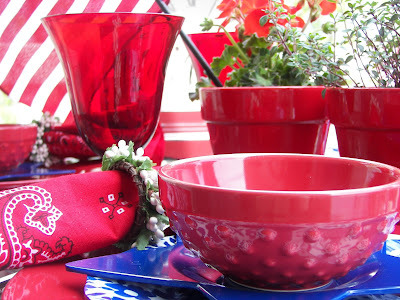 I love a red table, and those red pots are festive and perfect for this table. I love bandanas as napkins too. They have such a great selection of patterns these days, too. Memorial Day growing up was about parades and trips to the cemeteries to remember and appreciate those who gave their lives for out country. It saddens me that where I live now, it is hardly celebrated publicly at all. I just made a comment and it put me in as anonymous! Hope that doesn't happen again. What a great table. Your red is always so pretty and I always admire the bandanas and the napkin rings. Hope you have had a great day and are celebrating! #4! I kept trying but it was kicking me out, now I know why. Another birthday surprise. It is fun to know not only that Betty is still popular but that you are way popular too. I love your happy red, white and blue table! I love bandanas as napkins too! I just need to go buy some. lol I do like your star plate. I'll let you in on a little secret...I don't think we care if you use those cute red pots next week too! I love them. 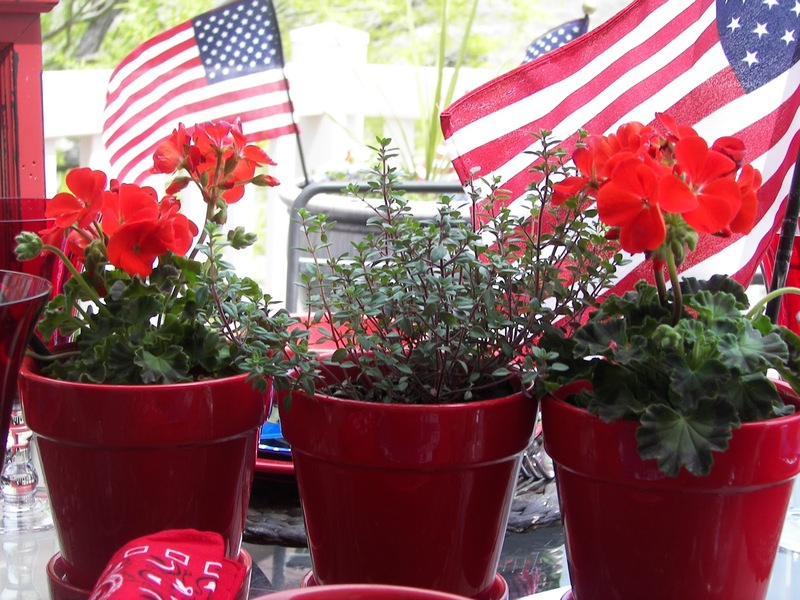 I love red, white, and blue too so I'm with you on using it all summer! Those little red pots look great. 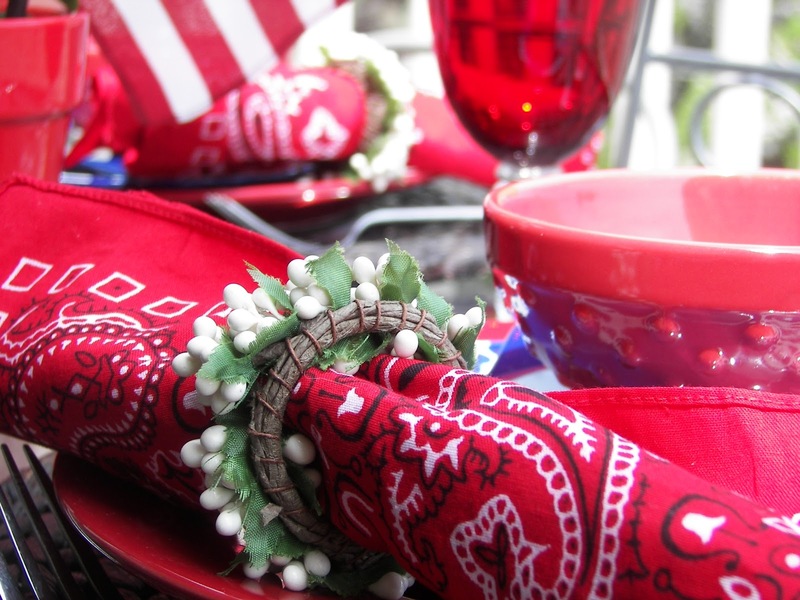 Bandanas are nice for napkins and yours look extra special with those pretty napkin rings. Beautiful. I love your little red bowls and all the goodies you have displayed on your table! Belted birthday wishes. Congratulations all the way around. Congrats on the Betty Crocker mention and congrats on your son's great.Being a parent can be soooo stressful. Love the table. I think you're right - you could use this all Summer long. So glad your birthday was as special as you are! Your table is lovely -- the bandannas in the wonderful napkin rings add such charm! Enjoy having your children home from school this summer! Between power outages and Blogger being messed up, it will take me until next week to see all the tables. 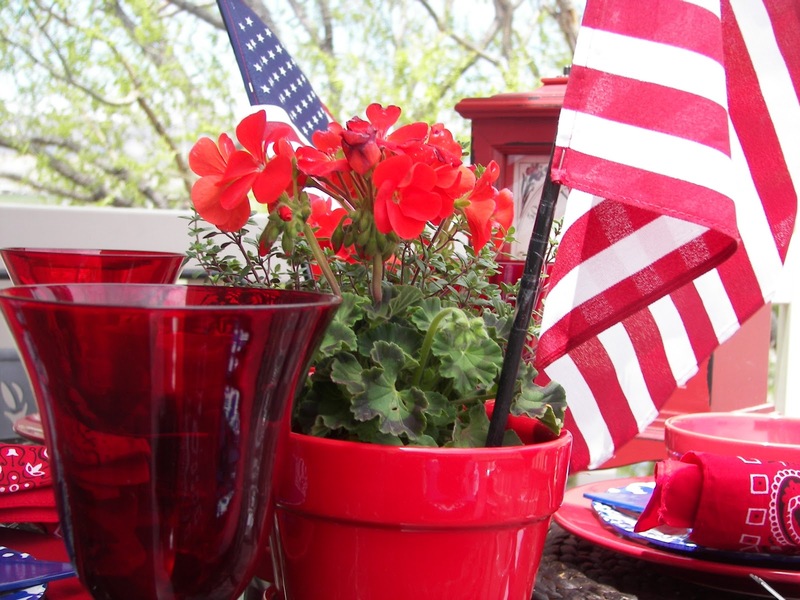 Your red, white and blue table is lovely. Love the red stemware. Love that table, and yes, I frequently choose to use bandannas as napkins. I could enjoy red, white, and blue all summer. Your table setting is beautiful, Joni! You can't go wrong with red, white and blue. Betty Crocker gave you a great birthday gift:) I hope Blogger gets it together SOON! My followers reappeared on my sidebar this morning:) Have a great weekend~hooray for summer! So cute, love all the red. Love all the red,white,and blue!! Have a wonderful weekend! Congrats on the BH&G link! It doesn't surprise me, because everything you do is very artful. Beautiful tablescape. Hope your long weekend was wonderful! AND Happy, happy belated birthday! That's so neat about the Betty Crocker link! Congratulations! Sorry I am late visiting! I love your table and belated HB! Commenting has been a nightmare. Happy summer vacation. Our kids go till the 24th.